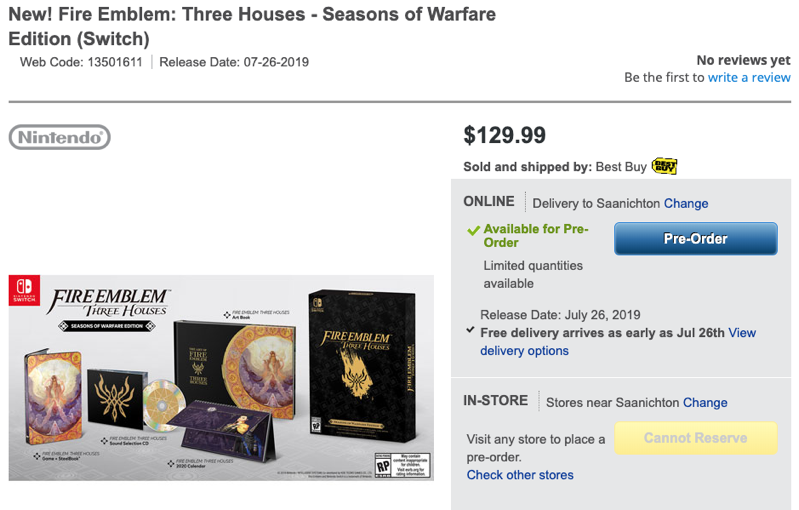 Nintendo’s pre-order for Fire Emblem: Three Houses – Seasons of Warfare Edition for its Switch console has been popping up from a variety of retailers, ahead of its summer release date. It’s one of the most anticipated games for Nintendo fans. War is coming to the continent of Fódlan. As its professor, you must lead your students in class and in tactical RPG battles wrought with strategic, new twists to overcome. The Fire Emblem: Three Houses – Seasons of Warfare Edition includes: Fire Emblem: Three Houses game, Fire Emblem: Three Houses Sound Selection CD, Fire Emblem: Three Houses Art Book, Steelbook and Calendar. Fire Emblem: Three Houses – Seasons of Warfare Edition is set to launch on July 26, 2019. This special edition includes the game itself, plus sound collection CD, art book, steelbook, and 2020 calendar.